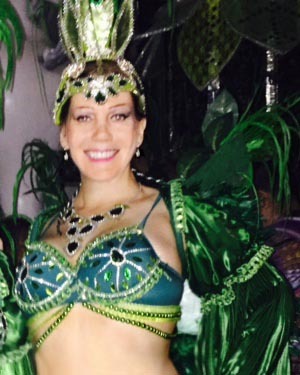 I was invited by a customer to fly to Brazil to attend the Carnaval festival with the Viradouro team. It was fascinating to have a rest from Japanese traditional music and have to learn a new song (in Portugese) and watch the dancers preparing. The Carnaval is a wonderful experience! Unfortunately Delta Airlines lost my bags and my costume on the way there. They promised to pay $50 per piece per day lost, and for replacement expenses for the costume they lost. Although I put in receipts so far they haven’t paid anything. The worse part of it was having to watch Delta Airlines ads about how great they are all the way back to Tokyo! In short, DON’T TRUST DELTA AIRLINES – they are CROOKS! Sayuki has been invited to India in July!!! If you would like Sayuki to give a talk, or would like to hold a banquet with Sayuki and her geisha sisters in India please contact her!